The moon has a direct pull on all living things. Each month the new moon grows into a full moon. As the moon increases it emits different degrees of energy. The human body is made up of 60 to 80% water. The same way the moon gives strength to the oceans, it also gives strength to the human body. 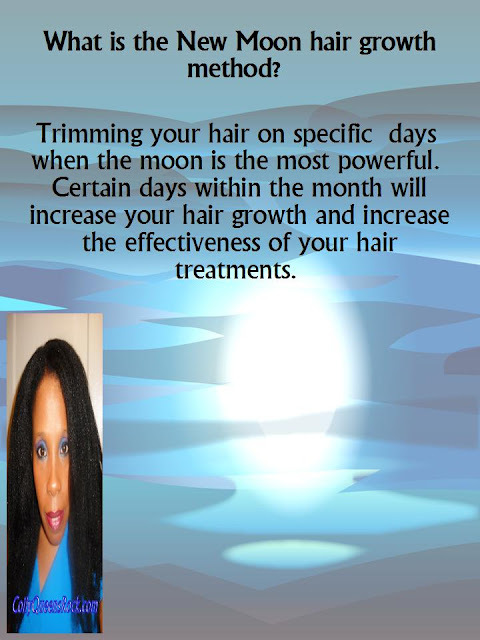 Trimming your hair as the moon grows, can change your hair growth rate. If you choose the right high energy day, your hair growth can double or triple. Take advantage of the moon's momentum! Healthy hair, requires regular trims. Since you have to trim anyway, why not try a new moon phase trim? ARE YOUR WASH AND GOES TURNING OUT LESS THAN FAB? Try styling your hair according to the lunar calendar. INCREASE THE DURATION OF YOUR FLAT IRONS OR HOT COMB PRESSING.